There are florists, and then there is Françoise Weeks. To say that she is extraordinary is not exaggerating. Originally from Belgium, a land where flowers are as important to everyday life as bread is to others, Françoise has been creating the unexpected in exquisite floral design since 1996. Lucky for us, she now calls Portland home. While images of roses or peonies might spring to mind when picturing a conventional floral arrangement, Françoise's should be categorized as remarkable: urban woodland creations and floral forward accessories. Her work is so outstanding and interesting that it appears regularly in both American and international bridal and floral design magazines. She was recently featured on an episode of Oregon Art Beat, the very one that won an Emmy award this year for the segment filmed about her work. You can watch the video here. Again, lucky for us she is a Pacific Northwest artist, likely the best in the business, right here in my neighborhood. One day recently a dear friend of mine and I visited Françoise at her Southeast Portland studio. Of course, I would not pass up a chance to meet the botanic maven, especially as this same friend had given me and my husband a woodland centerpiece for a wedding present in 2010, a detail of which is pictured above. Let's break down her two distinct styles. 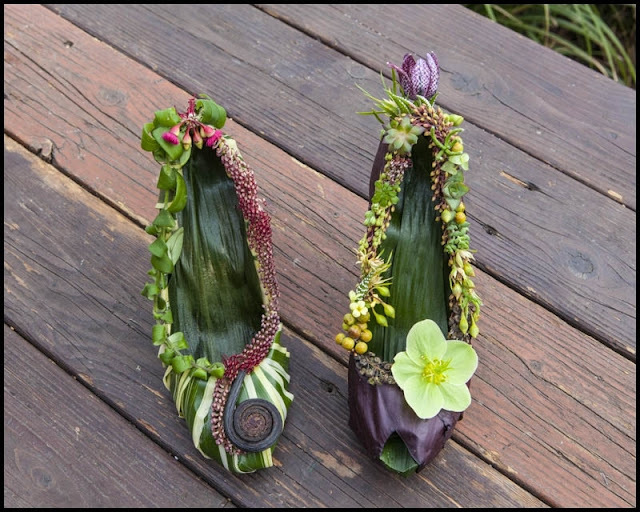 Her "urban woodland" designs are described on her website as "contemporary stylings of mosses, lichens, bark and forest floor gathering" while her "floral forward" designs are "exquisite botanical haute couture creations of purses, headpieces and shoes." 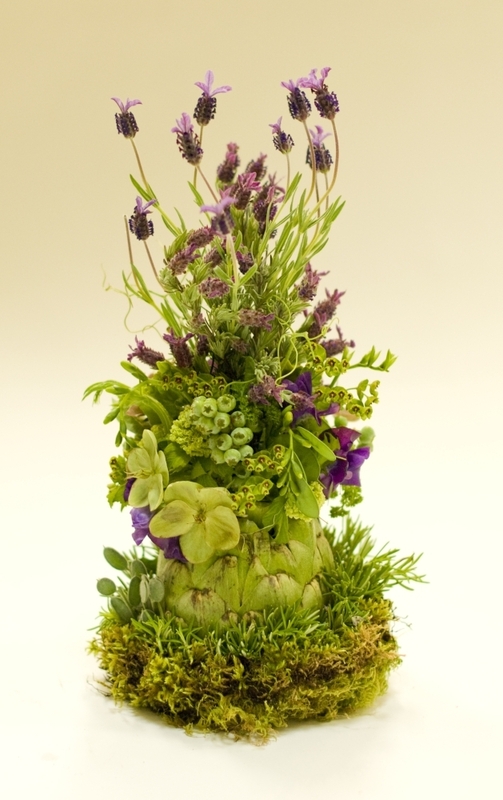 Pictured above is a centerpiece using an artichoke as a base. Françoise's inspiration when choosing materials comes from a variety of materials, not the standard fare found at floral markets. She looks to the woodlands that surround her Portland abode for inspiration as well as seed pods, mosses, imperfect flowers, vegetables, berries, even grasses, succulents and ferns. Her work is described as lush, textural and sometimes elegantly simple . . . depending on the assignment. She doesn't necessarily plan ahead when immersed in the creative process; rather she allows her intuition (a fine-tuned skill in her case) to take over. Pictured above is a signature centerpiece for Françoise, a woodland log filled with layers of wonderful surprises. You can keep looking and looking and never tire of discovering tiny seed pods, odd vegetables and textured leaves. Pictured above are some of the fabulous structures that are the start of Françoise's creative process, some of which she purchases at the floral market. They will become centerpieces of some kind for very fortunate clients. While this day she was getting ready to leave town for several weeks to teach workshops in Europe, her studio was not as full as it would normally be. We still had fun goofing around, trying on bark bits as hats. And it should be noted that she knitted the sweater that she's wearing. Why am I mentioning this? It's how my friend Danita and Françoise came to become friends as they are both dedicated knitters and met at a knitting class that Françoise was teaching. Aah, talent simply pours out of some people. A tour around her studio, even if it was a bit light on supplies on the day I visited, was nonetheless fascinating. These will become textures of centerpieces, designs and haute couture floral designs - dangling earrings, perhaps? Bits of bark, lichen and mosses from nearby woodlands. I definitely see the beauty in these. Jewels fit for the fashion world. Here is an example of her "floral forward" design. How romantic to wear living jewels. I would feel a princess, no doubt. In fact, at the Portland Garden Blogger's Fling kickoff evening party last summer, Kate Bryant, Portland garden writer, wore some very wearable floral art à la Françoise. More "floral forward" designs. Shoes turned into living art. If you're interested in taking classes to learn some of her techniques, you're in luck. 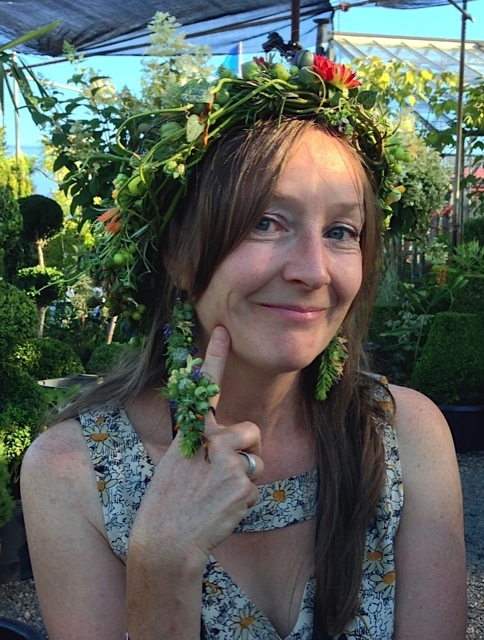 As well as creating thoughtful and innovative floral works of art, she also teaches workshops and individual classes on how to create your own woodland or floral masterpiece. Imagine the possibilities if you are planning a wedding, for example. Here is a link to her workshop schedule. You can also contact her for private classes and consultations at $90 an hour. What fun that would be! More supplies and intrigue from her studio. Some gorgeous wood with infinite possibilities. Here is the woodland masterpiece we received as a wedding gift in 2010. Back then I was not that savvy with photography, so must apologize. I hope something of the magic comes through here. It was incredible. A memory of the smell of the forest floor, of a whole world in miniature, something cool and fresh, something that slips away but glimpses evoke memories of the best kind. There were so many mesmerizing details of lichens, mosses, berries and succulents. I looked at it very carefully for a very, very long time. It was the most unique and thoughtful wedding gift we received. I was thrilled to have met its creator, such a warm and lovely woman who is an artist-on-the-go. She's very busy, extremely hard-working and so talented it's mind-boggling. Here she is, just outside of her studio. Her garden, which inspires many of her creations. I don't recall ever seeing a larger maidenhair fern in all my days. Françoise uses a lot of native woodland plants in her centerpieces, a very innovative move as I think they are underused and incredibly beautiful with a lot of potential. More inspiration from her own garden. Thank you, Françoise, for the incredible visit. I am humbled by your talent and Portlanders everywhere should rejoice that such a talent is here in our town. She is celebrated internationally, and I think us Portlanders have a treasure in Françoise, the best in the business. This post is also in celebration of American Flowers Week, the inaugural campaign to promote American flowers, foliage and designs. This week-long celebration of domestic flowers was created to raise consumer awareness and unite America’s flower farmers with the U.S. floral industry. 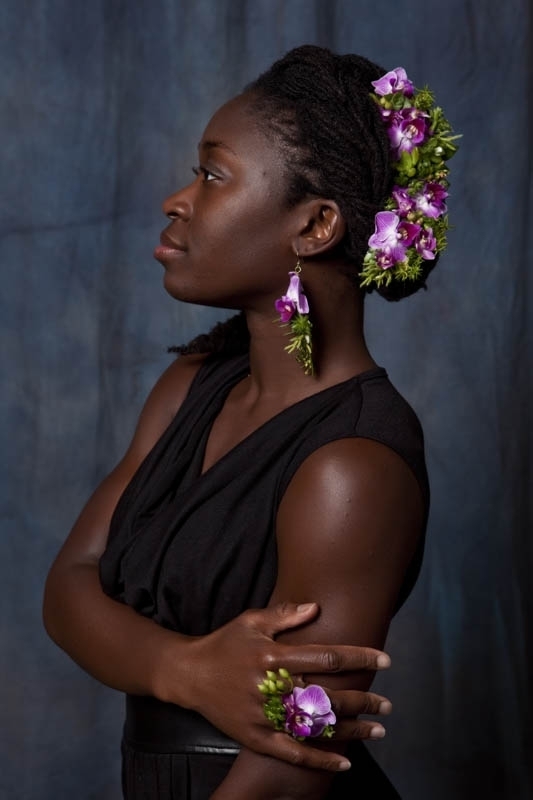 This movement, or slow flowers movement was launched by Deborah Prinzing of slowflowers.com , promoting quality, sustainability and economic impact of American-grown flowers. She invites florists, designers, flower farmers and all of us flower enthusiasts to participate. That's it for this week at Chickadee Gardens. As always, thank you for reading and, until next time, happy gardening! So much talent and the ability to see the possibilities in what many would consider debris is very humbling. I can see the beauty, but I'm very bad at putting the bits and pieces together. Thanks for showcasing this remarkable woman. Her work makes me feel very humble too, Alison. If you and I can't put the pieces together ourselves, we can at least hire her to make them for us! She's something else, full of life and creativity and lots of love in that heart of hers. She loves plants and living things, it's clear to see. Thanks for reading, guys! There should be another term for what she does - "florist" doesn't even begin to capture it. Natural artist? Creator of temporal art? 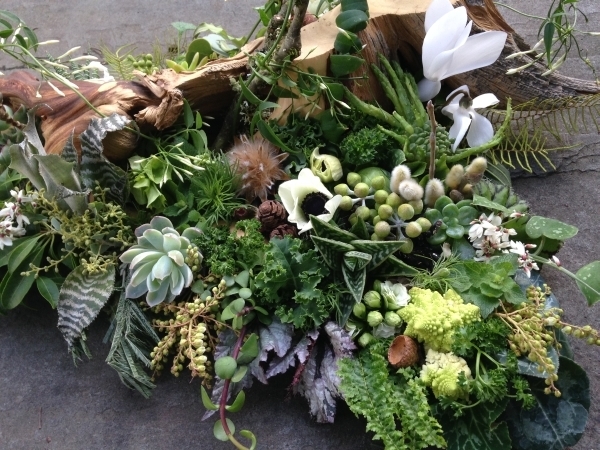 Thanks for sharing your visit - and expanding my concept of floral arrangements in the process. So true, Kris. Florist doesn't capture it. Artist doesn't encapsulate it fully either. The world should know about her, at least the botanic-loving world....you are welcome!! thanks for reading and commenting, Kris! Jealous! What a fun studio visit that must have been. I'll drag you with me next time, Danger! Maybe we should arrange a class of some sort for garden bloggers. Wow - that is wonderful! I would love to pray at her altar at one of her teaching sessions. What a treasure - and right here in Portland... Thanks for opening my eyes, Tamara! I´m in love with Francoise´s work since I saw Kate's floral complements in the Fling last year. I immediately started following Francoise on facebook when I got back to Spain. I wish I could attend one of her courses because I think what she does is the most beautiful floral art I´ve ever seen. But it is too expensive for me now. Maybe in the future I´ll be able to :). You portlanders a very lucky in many ways related with plants! (natural landscapes, gardens, nurseries, plantsmen and women, florists...what else can you ask for?) Great post! Oh, Lisa - that's wonderful. I'm glad you follow her. We are very lucky, and I wish you could be here and join us in taking a class with her. Well, perhaps one day she'll come to Spain - keep tabs on her calendar, I think she just got back from a trip to the UK so it's not impossible! Her genius in actually gathering all those bits and pieces into works of art is enviable. If you ever organize a class for bloggers, count this one in. Just being able to soak up the atmosphere in her studio would be attraction enough. I will - I think we should do a class, Rickii. Let's plan one! Thanks for reading and commenting, Garden Patio! She is a talent, that's for certain. That sweater is wonderful, my friend is also an incredible knitter. Talent, talent everywhere! Thanks for reading and commenting, Luisa!